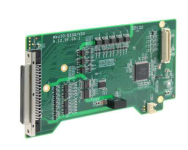 This I/O card can be mounted inside the CRNS360, CRNS365, or CRNS124 computer to enable precise monitoring and control of digital signals. The 16 digital inputs have unipolar photo-couplers and offer 3,750 Vrms isolation. Channels 0 through 7 can use either sink or source wiring, with each channel having an independent common. Channels 8 through 15 use sink wiring with a shared common. Voltages of 5 to 24 VDC are read as "high" while voltages 1.5 to 5 VDC are read as "low". There are also 16 digital outputs of sink type. They have a MOSFET interface with 3,750 Vrms isolation. Each channel can drive up to 500 mA continuous duty, using 30 VDC maximum. In deterministic mode, the on-board MCU will quickly respond to input signals to turn on outputs. This occurs independent of the host CPU for repeatable timing. The on-delays and off-delays are configurable in increments of 25 microseconds. This can be ideal for enabling multiple cameras and lights using a single trigger sensor. External terminal block and cable sold separately.